Mehrban, N. and Bowen, J. 2017. Monitoring and Evaluation of Biomaterials and their Performance In Vivo. p. 81. Zhao, Q, et al. Characterization of virus-like particles in GARDASIL(R) by cryo transmission electron microscopy. Hum Vaccine Immunother 10 (2013), 1. Mulder, AM, et al. 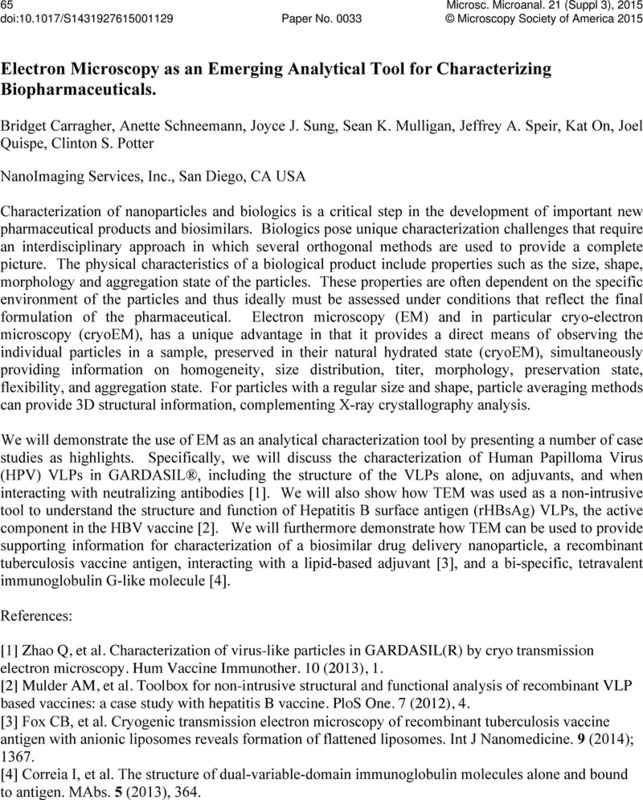 Toolbox for non-intrusive structural and functional analysis of recombinant VLP based vaccines: a case study with hepatitis B vaccine. PloS One 7 (2012), 4. Fox, CB, et al. Cryogenic transmission electron microscopy of recombinant tuberculosis vaccine antigen with anionic liposomes reveals formation of flattened liposomes. Int J Nanomedicine 9 (2014), 1367. Correia, I, et al. The structure of dual-variable-domain immunoglobulin molecules alone and bound to antigen. MAbs 5 (2013), 364.